Yesterday I got an email from someone who had particular questions related to some of my views about theology and God as mentioned in the video below. They were interesting to me and so I'm replying publicly here for you all as well. How do these answers sit with you? Are they things you'd say of yourself as well? Am I a loon? I think that your imagery of us being fish and God being the water we are in lines up with what Paul spoke about on Mars Hill. "In Him we live and move and have our being." The analogy of the fish not being able to see the water (or itself) clearly in the mirror also lines up with Paul in 1 Corinthians 13. "For now we see through a mirror, dimly." Does that work for you? It seems you think Theology is man made. True? Yup. Though the truths that they refer/point towards are simply the way things are ordered under God, our models for that ordering are only that, models, and those models are indeed made by humanity. Inspired at times, sure, but crafted by limited by human minds. It seems that you think that in our current state of existence we are incapable of "really" knowing God. True? Yeesh… A lot hangs on "really" doesn't it? Hmmmm… I think I would say that it is not possible to know God in God's fullness. I'm thinking here of things like Isa 55:6-9, especially, the balance between "… he may be found; call on him while he is near…" and "'my thoughts are not your thoughts, neither are your ways my ways,' declares the Lord. “As the heavens are higher than the earth, so are my ways higher than your ways and my thoughts than your thoughts." That is, of course there is a nearness and a knowledge of God. Praises! In there very least we have scripture by which God's work is recorded, and I believe that we still have the gift of the Spirit which Jesus said he would send from the Father. And/but… I believe we commit a sin of hubris when we claim to know God or God's will in its complete fullness. That is, God's Goodness, Beauty, Love, Being etc. is so profound that our words will never be sufficient to capture the essence or the nature of our reliance upon that Holy power. 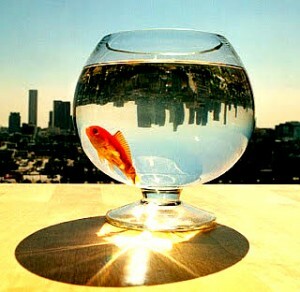 It seems that you think that God does not "reach out" to communicate with the "fish" living inside of Him. True? Disagree entirely. It's just that sometime we don't get the message well, or don't slow down enough to listen. You seem to come from a "liberal", "man-centered" approach to Christianity and theology. True? "Liberal Christianity, broadly speaking, is a method of biblical hermeneutics, an undogmatic method of understanding God through the use of scripture by applying the same modern hermeneutics used to understand any ancient writings. Liberal Christianity does not claim to be a belief structure, and as such is not dependent upon any Church dogma or creedal statements. Unlike conservative varieties of Christianity, it has no unified set of propositional beliefs." I do tend to think that there is something particular about humanity that is different that the rest of Creation, so I tend to be humano-centric in the sense that I don't think we are just the same as rocks or water, but I doubt that was what you were suggesting… Perhaps you can explain more what you mean about that and I can better answer you. not related to this specific post per se, but of more general in nature. i just discovered your blog/videos, and i've only read/seen a few, so i don't fully understand your positions. or find her books at various places. anyway, perhaps you're already familiar with her, but if not, i think you might appreciate her work.